We are not alone. In the back of your mind, in your heart of hearts, you know we’re not alone. The idea is preposterous to you. Even the Vatican says it’s OK to believe. And remember, they’re theophagists and believe in the devil. The Vatican’s chief astronomer says there is no conflict between believing in God and in the possibility of extraterrestrial “brothers” perhaps more evolved than humans. “In my opinion this possibility exists,” said the Reverend José Gabriel Funes, head of the Vatican Observatory and a scientific adviser to Pope Benedict XVI, referring to life on other planets. Somebody would have said something by now, right? You know that the vast majority of folks believe in something else out there. And so do you. Be honest. But if there was something to this UFO thing, how could they keep it quiet for so long? Keep in mind that the Manhattan Project employed over 130K people and secrecy was never breached, Klaus Fuchs notwithstanding. So the next time someone gives you that nonsense trope that secrets can’t be kept, remember this fact. Not to mention our government’s horrid history with syphilis and LSD studies or the CIA-directed overthrow of democratically elected countries and the like. Or JFK’s being whacked in prime time. The evidence that has been collected is enormous. And you’d never guess it from our braindead media. Lionel’s Paradox. You can close your eyes and talk to an invisible God, an anecdotal God that has been only written about and talked about and worshiped without one shred or piece of data ever having been collected anywhere, nothing even approximating proof. No eyewitness anything. No photos, doctored or otherwise, paintings or drawings of first-hand observations, no descriptions, eyewitness testimony, scientific indicia — nada! Not one shred of anything approximating what could be considered the loosest definition of evidence. And yet not only will societies all over the planet understand what you’re saying immediately but in many instances you’ll be lauded for your faith. But claim to have seen something that we colloquially refer to as a UFO, refer to some mind-blowing experience. A craft of maneuvering abilities and speed that we’ve yet to imagine or witness. A craft that doesn’t seem to utilize aerodynamic properties as we know them but perhaps electromagnetic or anti-gravity ones that we collectively refer to as “science fiction.” Claim to have seen what tens of thousands throughout recorded history have seen and photographed and videotaped. Then you’re nuts. Gotta love the Brits. Project Condign is a 400-page report titled Unidentified Aerial Phenomena in the UK that drew on approximately 10,000 sightings and reports that had been gathered by the DI55, a section of the Directorate of Scientific and Technical Intelligence (DSTI) within the Defence Intelligence Staff (DIS). The UK shows less of an institutional resistance to at least even exploring the subject. But these have to be hallucinations, right? Think about it: 10K hallucinations, 10K weather balloons or skunk works, top secret military experiments. Ten thousand lunatics all meeting together, conspiring to produce the same psychotic yarn over generations with remarkable similar characteristics. But no problem with God. In 1999 an important document was published in France entitled, UFOs and Defense: What must we be prepared for? (“Les Ovni Et La Defense: A quoi doit-on se préparer?“). 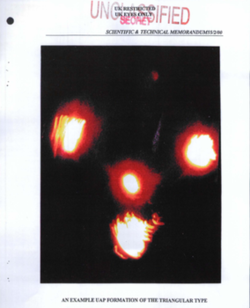 This ninety-page report is the result of an in-depth study of UFOs, covering many aspects of the subject, especially questions of national defense. The study was carried out over several years by an independent group of former “auditors” at the Institute of Advanced Studies for National Defense, or IHEDN, and by qualified experts from various fields. Before its public release, it has been sent to French President Jacques Chirac and to Prime Minister Lionel Jospin. The report is prefaced by General Bernard Norlain of the Air Force, former Director of IHEDN, and it begins with a preamble by André Lebeau, former President of the National Center for Space Studies (Centre National D’études Spatiales), or CNES, the French equivalent of NASA. The group itself, collective author of the report, is an association of experts, many of whom are or have been auditors of IHEDN, and it is presided over by General Denis Letty of the Air Force, former auditor (FA) of IHEDN. The documentaries on the subject are mind-blowing. Were it not for the Internet and my beloved YouTube, I’d have no idea of the range of testimonial evidence from top-notch credible sources. I had come to believe in the notion that all observers were named Bubba who lived in double wides and were anally probed. Listen for yourself these witnesses and their testimony. You be the judge of their credibility. Jurors are asked to do that daily. Do these folks sound crazy or part of some conspiracy? See for yourself. LIONEL PODCAST: The Most Dangerous Person In Our Country. Take A Good Look.